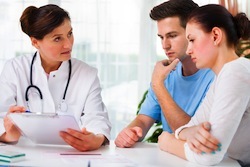 Diagnostic workups are a crucial part of fertility planning and treatment. According to researchers from the University of Foggia, the anti-PLAC1 antibody may prove to be an important part of future workups. PLAC1 antibody is a placenta-specific antibody. The presence of anti-PLAC1 could be a precursor to repeated implantation failure. The results of the study were published in the journal Placenta. The study was completed with two groups of women. Both groups consisted of active and control participants. Group one consisted of 21 infertile patients and 81 controls. Group two consisted of 16 infertile patients and 67 controls. Controls were fertile. The ELISA test was used to determine anti-PLAC1 levels. About 29% of women in group 1 measured anti-PLAC1 levels about the 95th percentile while 25% of women in group 2 measured the same. Anti-PLAC1 levels in the infertile group were measured against control values. Conclusion: It may prove beneficial for fertility specialists to include anti-PLAC1 levels in the initial and subsequent workups, especially for patients with recurring implantation failure. Source: Matteo M, Greco P, Levi Setti PE, Morenghi E, De Rosario F, Massenzio F, Albani E, Totaro P, Liso A. Preliminary evidence for high anti-PLAC1 antibody levels in infertile patients with repeated unexplained implantation failure. Placenta. 2013 Feb 20. pii: S0143-4004(13)00036-2. doi: 10.1016/j.placenta.2013.01.006.